Among the stereotypes that cling to Californians: Their love of—no obsession with—dogs. 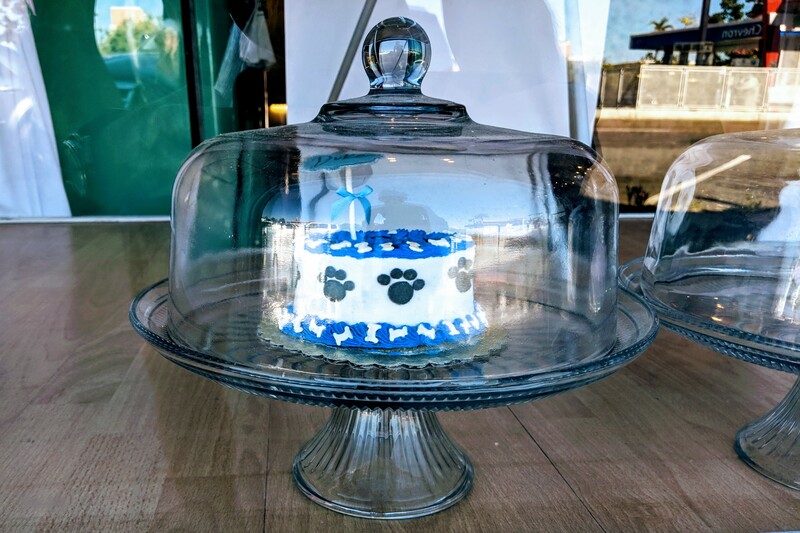 Take a peek into this window of a local dog bakery. I could understand meat pie. But cake? Welcome to SoCal, where residents primp tail-waggers and fawn incessantly over them. I am aghast how the fussy folk here let their beasts pee and poop everywhere. Sure, most dog walkers carry baggies to clean up the hard deposits. But the liquid soils sidewalks and anything along them; considering how rarely rain falls, this crap clinging to shoes and dust that becomes airborne can’t be healthy. So why in a state where residents also are lifestyle-profiled as being health-obsessed is there such contradiction? In County cities Carlsbad, Del Mar, Encinitas, San Diego, Santee, and Solana Beach, there are about 162,000 licensed dogs, according to official statistics. Human population for the same locales is about 2.15 million, says the Department of Animal Services. FYI: San Diego Humane Society assumed responsibility for providing county animal services to these communities during second quarter of this year. If you’re local, and interested in domestic or wild beasties, SDH’s annual report is informative reading. As for the Featured Image, I captured the fido confection using Pixel 2 XL on Sept. 14, 2018. Vitals: f/1.8, ISO 50, 1/308 sec, 4.459mm; 9:43 a.m. PDT. Pic is cropped 3:2 with Reel filter applied in Google Photos.